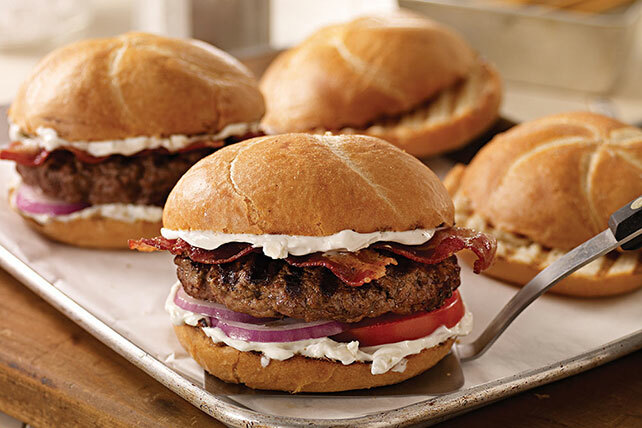 Secure your title as Master Burger Maker with our delicious Bacon Blue Cheese Burgers Recipe. There's a secret ingredient in our Bacon Blue Cheese Burgers. Shape ground beef into 4 (1/2-inch-thick) patties. Grill 5 to 6 min. on each side or until done (160°F). Meanwhile, mix cream cheese spread, milk and blue cheese until blended. Spread cream cheese mixture onto cut sides of rolls. Fill with vegetables, burgers and bacon. Grill cut sides of rolls before spreading with cream cheese mixture and filling as directed.